Nothing is perfect. Limitations of brain-based learning do exist. No one process or paradigm can solve ALL of the problems in education. The brain itself has limitations, and all of us are part of the process. They are no more difficult than the limitations you find in any other teaching and learning situation. It will take exposure, awareness, skill-building, and time to become adept. But it can be learned in a fun and supportive way. You can learn the skills and strategies to control how well your students learn. Brain-based learning is a new paradigm in teaching that integrates instruction with the optimal method in which the brain learns and stores information. If there weren’t limitations of brain-based learning, as with all learning, then everyone could potentially know everything there is to know. principles of how our brain works. Although brain-based learning takes into consideration the way the brain best retains information, it also is subject to its flaws and weaknesses. The human brain is not optimally designed, nor did it evolve for the purposes of formalized classroom instruction. Thus, there truly are limitations of brain-based learning because it takes people (like you) to implement it and we all have limits on our time and resources. Here are a couple of examples of limits in a classroom. If you understand computers, then this analogy may help you. Short-term memory is something like virtual flash memory on a computer. It is very fast, immediately reflecting what has passed before it, but there is work involved in transferring the contents to longer-term storage. Additionally, there are limitations to its capacity. The hard drive of a computer can store a great deal of information, long-term, but the limited size of the virtual flash memory focuses on speed and immediate use—not on long-term storage. So it is with the brain. Most of us cannot focus and pay attention for long periods of time because of the limitations brought on by distractions from the environment and from extended memory intrusions, which are distractions of the mind. Even though it is difficult for people to maintain focus for long periods, we do have the capacity to drive that ability upwards in times of need. Most teachers understand that concept but are not able to teach the skill. Through adapting the lesson material, teachers can develop the ability to motivate students to drive up that skill and, thus, pay better attention. Your students’ brains were designed to pay immediate attention to things involving movement, emotion, novelty, contrast and social attraction. A school is chock-a-block with those variables. No wonder students have trouble focusing! In short, we are all born with a practical, short attention span. School can be challenging for most, not just the AD/HD kids. With too much stimulus in the classroom or from life in general, getting students to pay attention and focus consistently is difficult. Learning to control that variable is part of the principles and strategies of brain-based learning techniques. Wouldn’t you, as a teacher, like to have the power to keep students on task and learning effectively even when they are resistant? If that is your wish, we can help you through our workshops and training. In your university education training, at one time you learned about Maslow’s Hierarchy. Simply put, Maslow’s Hierarchy dictates that when basic human needs are not met or are disrupted, then higher functions are not going to happen. For example, if children are emotionally distraught, hungry, or in fear, then their learning potential is right down near the bottom. The result of this is simple; many kids are not in the mental or emotional “state of mind” to learn well. But there is a solution. they learn to like school more. So, Jensen Learning sponsors an amazing 2-day event on Tools for Maximum Engagement that will teach you 101 strategies to apply to your teaching to engage even the most reluctant, recalcitrant, hard-to-reach children. Children in poverty are different, whether it’s rural or urban, generational or situational and relative or absolute poverty. 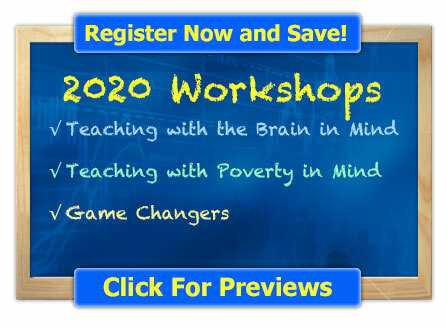 The bulk of the neuroscience evidence shows that the experience of poverty does change their brain in areas such as the emotional, language, memory, stress and processing centers. These children suffer greatly in school compared to other children. Teachers need to be equipped with better strategies for teaching these children. You can make a safe bet that such children get far less educational support at home, as well, due to single, working parent situations, and lower levels of parent education. Again, Jensen Learning can help. How? 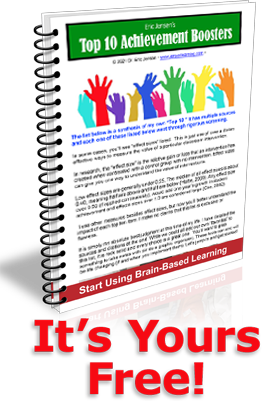 The human brain is designed to change; however, you have to know how to do it! Jensen Learning is committed to helping you overcome the limitations to learning and the limitations of brain-based learning. On our website, see the many ways you can help yourself while you are helping them.